If you aren’t currently suffering from neck pain – be patient, it will probably happen fairly soon. As summer starts cooling off and winter rolls around, we find that more and more people are impacted by the cold. Why Do We Get Neck Pain in Winter? The answer is fairly simple, but it is a fascinating subject. Consider this; when you are outdoors and a cold wind picks up, what do you automatically do? Instinctively you wrap your arms tightly around your body, bring your shoulders up and your chin down to protect your ears and neck area. As humans, we are hard-wired to cuddle up when we’re cold and spread out when we’re hot – it’s how our bodies work. So there you are, hunched up in the cold, possibly gritting your teeth to stop from shivering, but what you don’t realise is that your whole upper body is now tense. The muscles have all contracted and you are holding them there… and holding some more. The constant contraction of the muscles affects the blood flow and this constricted flow causes cramps and stiffness. Barring any existing medical problems, a cold neck equals a stiff neck. But it’s not just winter’s icy grip that affects us. If you sit in front of a computer for extended periods of time, then you’ve probably suffered from neck pain too. Poor posture, long hours looking at a poorly positioned screen or holding your phone in your shoulder will certainly cause discomfort. While we’re the biggest advocates of aircon, they do need to be on the right setting and not blowing directly onto the back of your neck. (We understand that this comment may require you wrestling the aircon remote away from your co-workers!) In fact, many people who wake up with neck pain have spent eight unconscious hours in the direct path of a blast of cold air. Without being too simplistic, if a stream of cold air on your neck is going to cause cramping and stiffness, then surely the answer is simple: warm air. Of course, this is where the Toshiba team enter the fray with a range of options to keep you, your family and your fellow office workers as comfortable as possible. With winter coming, you will no doubt be switching your air-conditioning units from cooling to heating. A word of advice – be gentle with your aircon. Switching from artic air to a balmy 27°C requires a little time. To preserve the life and health of your best friend (aka your aircon) it’s a good idea to let your system complete its cycle and allow the compressor to turn off before hiking up the temperature. A good maintenance schedule is a good idea at the best of times, but when preparing for the cooler winter months a little upkeep is wise. Be sure to regularly check and change your air filter, as well as the outdoor fan. Check for leaks and ensure that the area around the unit has sufficient clearance. While it may seem far away, the cold weather is certainly on its way. Make sure that this winter is the most comfortable one yet and totally free from neck pain. 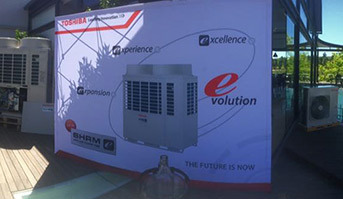 Contact your Toshiba team for all your air-conditioning needs. Why Choose A Ducted Air Conditioner System For Your Home? Why Are the Elderly at Risk of Heat Stroke? Is it ADHD, Or Is My Child Just Too Hot? Soaring Summer Temperatures Equal Heatstroke. How Can You Stay Cool? Talking Temperature Control: You May Have a Bun in the Oven, But You Don’t Want to be Sitting in One. Read The Small Print – Does Your Airbnb Have Air-Conditioning?